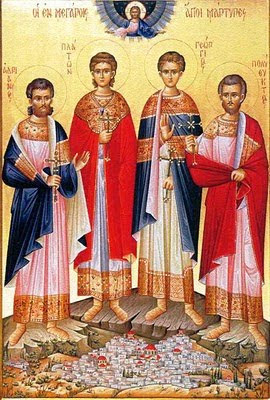 The year and manner of martyrdom of the Holy Martyrs Adrianos, Polyeuktos, Platon, and George are unknown. But we do know the wondrous manner in which the relics of these holy martyrs were found by the grace of God in Megara. In the year 1754, a cleric named Oikonomos (which could have something to do with being "Oikonomos" of the Patriarch of Jerusalem) wanted to build a house. When the workers of the community were digging and constructing the foundations, one of them claimed that he felt an intense heat at his feet, and indicated that he couldn't keep working. The Oikonomos put his hands in the spot, and paradoxically felt the same heat as the worker. The rest of the workers, however, kept digging until they hit a marble slab with the following inscription on it: "Λείψανα Μαρτύρων. Αδριανός, Πολύευκτος, Πλάτων, Γεώργιος" [The relics of the Martyrs Adrianos, Polyeuktos, Platon, George]. Lifting up the plaque, he found the all-holy relics of the Holy Four Martyrs, and he glorified God for the heavenly blessing and consolation which he granted to them. In the place where the relics were found, further excavations revealed a large Early Christian Basilica which dates from the mid-5th to the 6th century AD, and which was built in honor of the Four Holy Martyrs. This filled the residents of Megara with joy, but also brought temptation, as someone during the night stole the majority of the relics and fled for Peloponessos. However, a few smaller pieces of the relics remained, and the Oikonomos took the marble plaque to Constantinople to show the Patriarch and tell him about these occurrences. Further excavations in 1998 uncovered more of their holy relics, which were placed in a beautiful reliquary and are honored joyously by the faithful. Their feast is celebrated on February 1st. For information on six other newly-revealed Holy Martyrs in Megara honored together with the above four as the Holy Ten Holy Martyrs of Megara, see here. The protectors of Megara, Champions ten in number, with Dorotheos, Saranti, Seraphim, and Iakovos, Demetrios, Basileios, Adrianos, Polyeuktos and George and Platon, faithful helpers of those in dangers, deliver those who cry to you, Glory to Him who glorified you, Glory to Him you magnified you, Glory to Him you grants to us through you, healings for all.